Oh boy, oh boy, oh boy—it’s another giveaway! Today’s National Teacher Appreciation Week Giveaway prize is five nature-themed books. 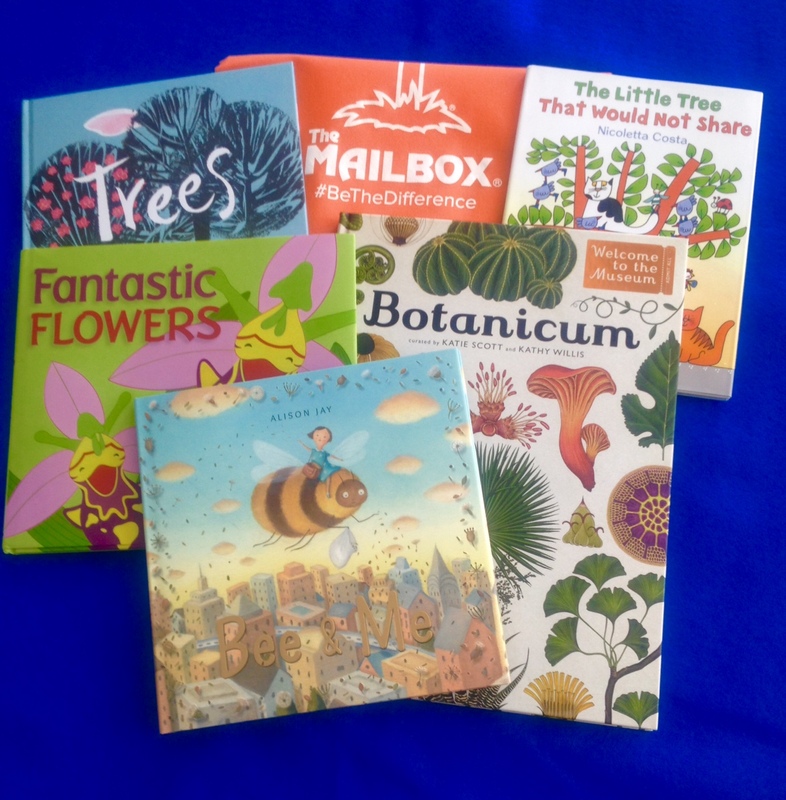 The collection includes a wordless picture book that reminds readers of the importance of bees in our ecosystem, a stunning picture book that introduces seventeen fantastic flowers, two books about trees that beg to be compared and contrasted, and a plant reference book like none other. So how can you enter to win this amazing collection? Simply leave your answer to the following question in the comment section of this blog. Be sure to do this before midnight on Sunday, May 14, 2017. I’ll announce the winner right here on the blog, and I’ll also notify the winner at the email address used to submit the comment. Here’s today’s question! Congratulations to Jenny S. (comment # 100), the winner of this nature-themed prize pack! PS: Don’t forget, Karen and Kim have special contests running all week. Check out their blog posts for more chances to win! Click here. My favorite flowers are orange roses!!! They are so beautiful as the sun starts to set. I love orange roses!!!! They are breathtaking as the sun goes down!! Hydrangeas are my favorite flowers. I love so many flowers!! My favorite spring flowers are lavender lilacs…..and bluebells…..and lily of the valley. My favorite summer flower is my raspberry pink painted daisy. One of my favorite flowers is the Evening Blue Primose- absolutely beautiful. Violets. They bring a sweet reminder of a childhood friend and my wedding, many years ago. Tulips, because they remind me of my grandma. I don’t have a favorite! I enjoy ALL flowers whether cultivated or wild! Gardenias! Such a sweet smell and admiringly beautiful! Peonies, they remind me of my grandmother. I love the Birds of Paradise. Fake. I am allergic to lots of flowers. Lilacs all the way !!! Black Orchid is my personal favorite! It’s the daffodil! There are so many beautiful colors and variety. Daisy if I have to choose just one! I love roses! Not red ones but unique colors!! Roses are red. They’re the ones for me! I like carnations and lilacs for flowers. Jasmine, called pikake (pee-kah-kay) in Hawai’i, is recognized by its tiny white petalsand delicate fragrance, and is sewn into an extra special lei for Mother’s Day, graduations, birthdays, … They are blooming in my yard near Pearl Harbor, Hawai’i right now. One of my favorite flowers is hydrangeas and I also like gladiolas. My favourite flowers to grow are marigolds. My favourite to have in a vase are lillies. Liliacs. Love the smell. Wish they were around longer. too many favorite flowers. I’m working on a butterfly/hummingbird garden and have so many beautiful color flowers. There’s nothing like Forsythia to say HELLO spring! California poppy is my favorite. Love anything colorful after a long winter, but gerbera daisies are a favorite! I love all flowers, but probably my favorite is the gardenia for it’s fragrance. In spring, I love daffodils. In summer, I love daisies and roses. In fall, I love mums. My favorite flowers are dahlias. How can we pick just one!? But one of my favorites is gladiolas. In Spring the ocean of wild violets surrounding my home makes my soul sing! In Summer the glorious rainbow of gladiolus blooming across my porch gladens my heart! My favorite flower is the pansy. they grow all year long, even in Vermont under the snow and they smell great. There are many crafts you can do withthe dried flowers. Stargazer lilies are my favorite! Chrysanthemums! So beautiful and a great story! Currently Lilacs!! In bloom and beautiful! I love Iris, Orchids, and Callalillies best, but flowers of all kinds are God’s gift to nature. I love the beginning of the Spring when this flower reveals itself with beauty, signifying spring and growth, and oh the smell is fantastic. If I had to pick a favorite I would have o say pansies. Who doesn’t love flowers? The roses, the forsythias, the lilies, orchids and lilacs all bring smiles to our faces. I really love a a small purplish blue flower grows in my lawn every spring. . It seems to be a wild groundcover. My mother won’t let my father mow that lawn as they start to appear. She says that they are her Texas Bluebonnets. It reminds her of my sister and brother who live in Texas with their families. This little flower holds a special place in my heart . A first sign of spring! My favourite flower is a crocus. I love hydrangeas! We had them in our wedding and there were 2 plants at our new house when we moved in. I’ve always loved gerbera daisies! Daisy, they always look fresh and fun! Tiger Lilies. I have a huge batch in the front yard that the previous owns planted. Love them! Favorite flowers are purple lillies! ???? Violets. The ones that grow wild in my area. My favorite flower is a tulip. I love the look of them and all the colors they come in. No favorite, I just like beautiful flowers!!! I’m not sure about a favorite but I do love them all because flowers make me relaxed and happy <3 I love these books shown, beautiful . I've been in love with hydrangeas, roses and sunflower arrangements. This is hard to answer we have had fresh flower in the class the past month our favorite so far have been the crazy daisy.